​Climate change has dire implications for polar ecosystems, which are losing much of the ice that defines their existence. The Arctic Biodiversity Assessment (ABA) was compiled by the Arctic Council. The ABA serves to provide baseline information against which further changes can be compared, and also to identify gaps in scientific knowledge of the Arctic. The Assessment could be a valuable resource for further conservation work in the Arctic. Key findings include the fact that the Arctic is being degraded but that decisive action can still make a difference and that climate change is the most serious threat to Arctic biodiversity and also intensifies all the other threats. The Arctic Council maintains a website that includes the full text of the Assessment and also fully explains the implications of the report for Arctic conservation. "Though a third of amphibian species worldwide are thought to be imperiled, existing assessments simply categorize extinction risk.... We found that overall occupancy by amphibians declined 3.7% annually from 2002 to 2011. Species that are Red-listed by the International Union for Conservation of Nature (IUCN) declined an average of 11.6% annually.... This analysis suggests that amphibian declines may be more widespread and severe than previously realized." There are many reasons for this decline, including habitat destruction and the widespread fungal disease, chytridiomycosis. Climate change is thought to play a significant role as well. The full text of the paper is available, for free, online. o An Associated Press article, published June 2013 , calls attention to dramatic losses in the Atlantic puffin population, possibly because of changes in the distribution of fish. Among other problems, many puffins have shifted from feeding their young mostly herring, a species that is becoming less available, in favor of feeding them butterfish, a southerly species that is moving north. Unfortunately, butterfish are too big for puffin chicks to eat, and many have starved to death. Puffins have been a dramatic conservation success story, since they had been badly over-hunted in the eighteen hundreds and have since recovered. They are now at risk again. o Australian news reports that a fish and dolphin kill in March and April 2013 has been traced to a combination of abnormally warm water, an algae bloom, and a virus. Members of a government task force investigating the matter say that warmer ocean temperatures stressed the animals to the point where ordinarily survivable problems became lethal. o A 2013 study shows that purple martins cannot adjust the timing of their spring migration in response to earlier and earlier spring warming. Since these birds' food sources do adjust themselves to the changing climate, purple martins may now be arriving on their breeding territories too late in the year to adequately feed their young. This could be one of the reasons purple martin populations are now declining. Similar problems have been suspected for many other bird species, and confirmed for some. 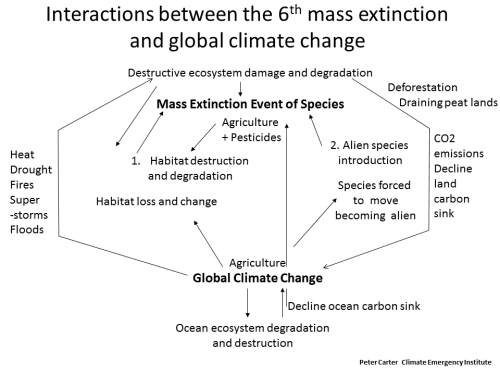 ​by C. Thomas Extinction Risks from Climate Change. ​Thomas paper is much worse than has been reported. ​It is 33% with dispersal benefit of species and 58% with no dispersal. 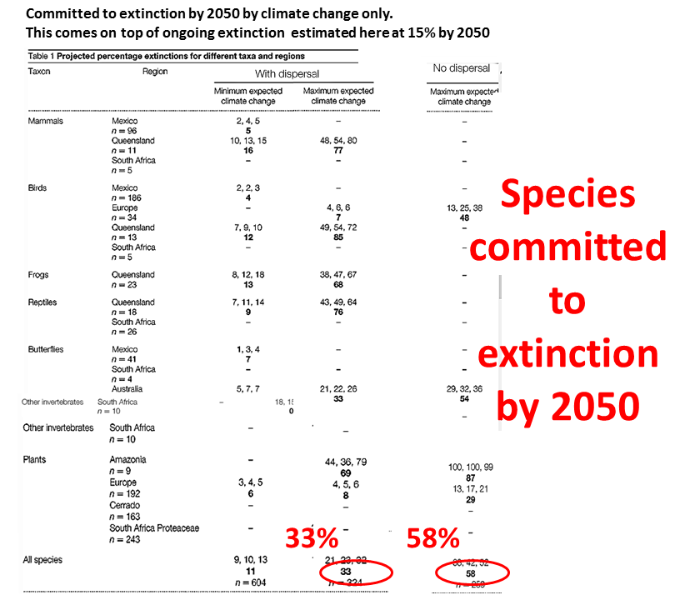 ​majority f species the 58% must be assumed most likely. We are on a fixed heading for a global warming of 6C by 2100 (International Energy Agency) and a possible 4C warming by 2060 (R. Betts 2011) . A World Bank reports shows ​we are also committing ourselves to a 4C warming. The IPCC 2007 assessment found that As global average temperature increase exceeds about 3.5°C (i.e. 4C from pre-industrial), model projections suggest significant extinctions (40 to 70% of species assessed) around the globe. Obviously we can expect polar, mountaintop and desert ecosystems and biodiversity to suffer large losses with even small degrees of warming. ​The Amazon is the greatest home of natural bio diversity and it may be particularly vulnerable to global warming, because it makes its own self sustaining weather. Deforestation is both a cause and a result of global climate change​. ​Oct 2013 Climate change affecting North American forests, researchers find. ​​As far back as ​​2000 Peter Cox published a model result (Acceleration of global warming due to carbon-cycle feedbacks in a coupled climate model) finding a high terrestrial carbon feedback warming of an added 1.5C by 2100 mostly due to a predicted Amazon die-back. The die-back results from increased Amazon drought and drying. ​We find that under a 'business as usual' scenario, the terrestrial biosphere acts as an overall carbon sink until about 2050, but turns into a source thereafter. By 2100, ... atmospheric CO2 concentrations are 250 p.p.m.v. higher in our fully coupled simulation than in uncoupled carbon models, resulting in a global-mean warming of 5.5 K, as compared to 4 K without the carbon-cycle feedback. Other models have been published without Amazon die back and lower terrestrial carbon feedback warming (0.5C). Field research since 2000 tends to confirm the risk of catastrophic die back under warming real. The carbon cycle modeling on the other hand suggests that high CO2 fertilization will protect the Amazon from global warming heat and drying, but if the assumed CO2 fertilization does not happen die back will. ​ A study has identified which species of three well-studied groups (birds, amphibians, and corals) are at risk of extinction from climate change. Many of the species identified as at-risk are not otherwise considered threatened, suggesting that conservation priorities need to be expanded. However, the less the planet warms, the fewer species will be put at risk, suggesting that while some further warming is now inevitable, it is not too late to avert the worst catastrophes. o The National Wildlife Federation released a report June 2013 stating that even many common bird species are under threat from climate change. Migratory birds especially are vulnerable because so many of them are extreme specialists dependent on several different habitats in sequence. For example, many birds time their migrations so as to be able to take advantage of food resources at very specific places at very specific times. As climate change shifts the seasons, the timing of availability for some of these resources is also shifting, and a shift by as little as a few days could mean that the birds arrive too early or too late to eat. A given bird species might need two, three, or more different habitats every year, and if the timing of just one of these fails, the bird cannot breed. The report calls for the United States to take a leadership role in controlling climate change by taking immediate action to reduce its greenhouse gas emissions. IUCN 2013 press release, the IUCN has updated its Red List of species by conservation status. This update reports about a third of assessed speciescurrently considered threatened or endangered. Among the most dramatic changes is that a full third of all known conifer species are now considered threatened or endangered. 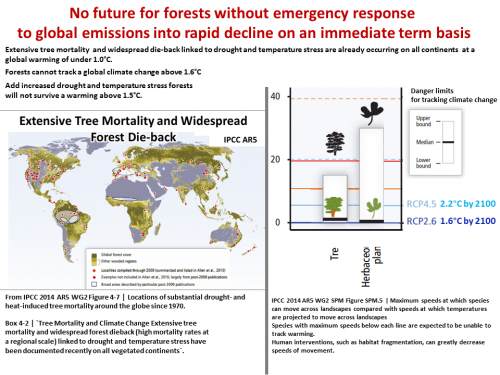 Natural Resources Canada published the first review of global tree mortality due to climate causes. Their report shows that increased tree dieback may occur in many areas and is already occurring in some areas. 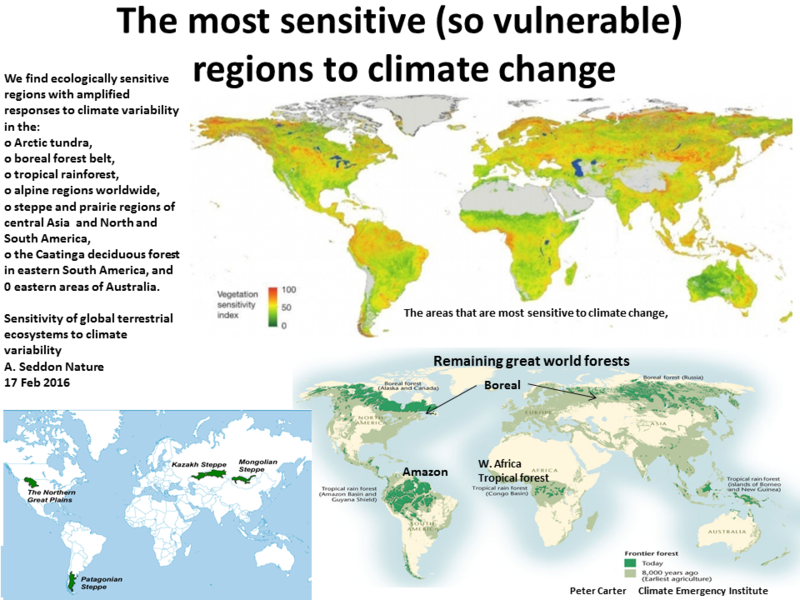 Many other forested regions will be damaged or lost by global climate change. A recent study shows that some forested areas that are becoming drier due to global climate change are no longer able to regenerate following forest fires. Instead, these areas grow back with other, non-forest communities. Trees, like many other organisms, are much more vulnerable when young, so that adult trees can persist in conditions too harsh for seedlings to live. This means that some sites that are currently forested will also be permanently deforested if struck by a major forest fire. Since increased fire frequency is also a likely consequence for climate change, sooner or later these areas will burn. 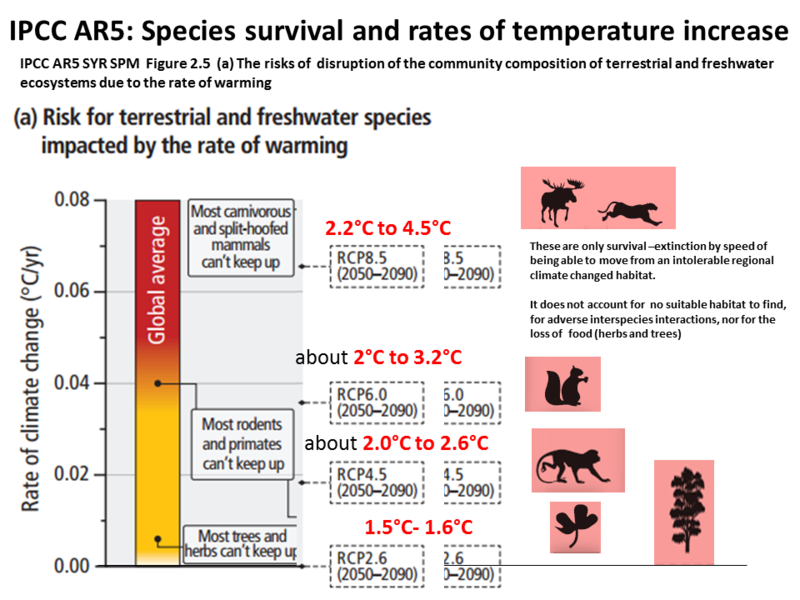 The image (right) , from the Intergovernmental Panel on Climate Change 2007 assessment , shows what different degrees of warming would mean for life on earth and what, exactly, will be lost if further climate change is not averted. Please note the IPCC note. These impacts are from climate change alone. In the real world they impact on top of the 6th mass extinction event due mainly to human habitat alterations. A huge number of species will not be able to adapt ​​to the rapid rate of climate change on top of direct habitat loss and degradation. Endangered wildlife species whose numbers are already declining, such as amphibians, migratory species, ​​and species with the longest reproductive cycles, are most at risk. Feedbacks, Uncertainty and the Precautionary Approach, covered the issue. ​In particular is this 2013 released NASA study Severe Climate Jeopardizing Amazon Forest. The published paper source is here. Nature 2012 Severe drought has lasting effects on Amazon Satellite data reveal effects of climate change on tropical forests. An area of the Amazon rainforest twice the size of California continues to suffer from the effects of a megadrought that began in 2005, finds a new NASA-led study. These results, together with observed recurrences of droughts every few years and associated damage to the forests in southern and western Amazonia in the past decade, suggest these rainforests may be showing the first signs of potential large-scale degradation due to climate change. 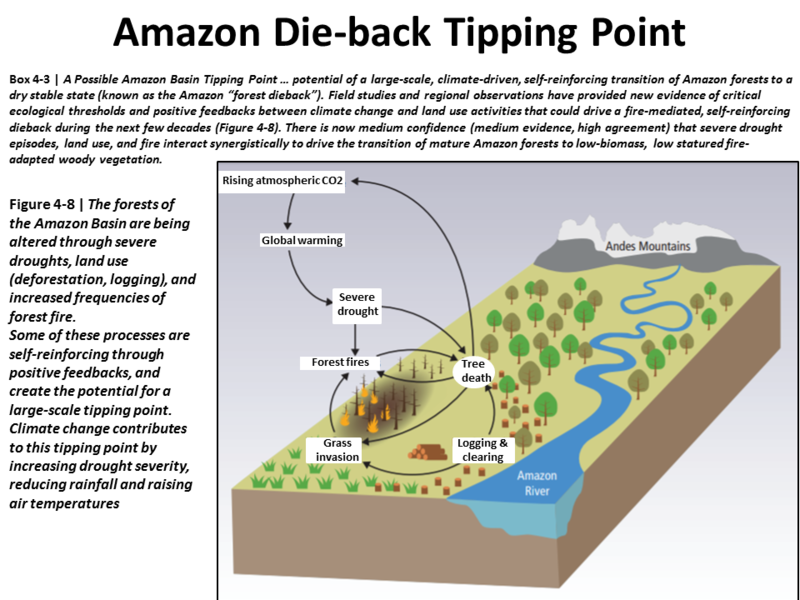 The record shows Amazon is experiencing a drought rate that is unprecedented in a century. It has been discovered that billions of trees died after the 2010 Amazon drought. ​Simon Lewis one of the study authors, a forest ecologist at the University of Leeds in Great Britain, commented - 'those two unusual events are consistent with those predictions that suggest that the Amazon may be severely impacted over the next few decades by these droughts,"
Another NASA observation reported 2013 finds Hidden Wildfires Taking Big Toll on Amazon Rainforest . These understorey below canopy in several years have affected several times more rainforest than intentional clearing. A 2004 Royal Society paper Contrasting simulated past and future responses of the Amazonian forest to atmospheric change​​ concluded We speculate that the Amazonian forest is currently near its critical resiliency threshold, and that "even minor climate warming may be sufficient to promote deleterious feedbacks on forest integrity." o An article, published in July by the University of Arizona News, draws attention to the dangerous speed of climate change. According to the study the article describes, vertebrates do not typically evolve rapidly enough to adjust to the current and projected rate of change. 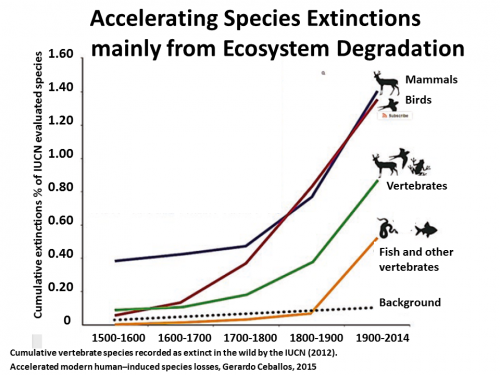 This means many species will go extinct, if they cannot alter their ranges quickly enough. And of course, many cannot alter their ranges. 2015 research shows the Amazon and Boreal Forests face climate change tipping points. 2 Aug 2013 Science Stanford review reports that ecosystem climate changes will intensify in the coming decades, unfolding at a rate that is potentially several orders of magnitude—more rapid than the changes to which terrestrial ecosystems have been exposed during the past 65 million years. The combination of high climate-change velocity and multidimensional human fragmentation will present terrestrial ecosystems with an environment that is unprecedented in recent evolutionary history. "Earlier IPCC reports described several ecosystems to be resilient to warming up to 1°C. ​​During the course of this century the resilience of many ecosystems (their ability to adapt naturally) is likely to be exceeded by an unprecedented combination of change in climate, associated disturbances (e.g., flooding, drought, wildfire, insects, ocean acidification) and in other global change drivers (especially land-use change, pollution and over-exploitation of resources), if greenhouse gas emissions and other changes continue at or above current rates (high confidence). Despite the recognized importance of multiple drivers of ecosystem change, they are rarely all included in current climate and ecosystem models used for assessing climate change impacts on ecosystems. The explicit inclusion of non-climatic drivers and their associated interactions in analyses of future climate change impacts could lead to unexpected outcomes. Consequently, many impact studies of climate change that ignore land-use and other global change trends may represent inadequate estimates of projected ecosystem responses." ​​​o While climate change is obviously altering what regions have the right conditions to support which plants. However, especially with very long-lived plants, such as trees, actual changes in plant community structure could take a long time to show up. Plants take time to move into new areas, and they can also persist in places where the climate no longer suits them, because adult plants can live under conditions that would kill their seedlings. These delays can last thousands of years. ​​A recent study explored the ways these delays can complicate both forest management and conservation in this time of rapid change. The long life cycle of trees may nor allow them to not migrate in response to raid warming. American research 2013 from Duke University finds the life cycle is being reduced ​bu the trees are no shifting. Research from Israel in 2011 ​​finds that Trees which disperse their seeds by wind, such as pines and maples, will be unable to spread at a pace that can cope with expected climate changes. The prevention of damage to global ecosystems beyond their resilience is a provision in the 1992 UN climate convention. ​​That limit was assessed at 1.0C back in 1990 because 'Temperature Increases beyond 1C may elicit rapid unpredictable and non linear responses that could lead to extensive ecosystem damage. (Rijsberman, F. R. & Swart, R. J. Targets and Indicators of Climatic Change Stockholm Environment Institute, 1990). The 2C policy target is global ecological catastrophe from the IPCC AR4 data. ​​The long term target is now 1.5C. 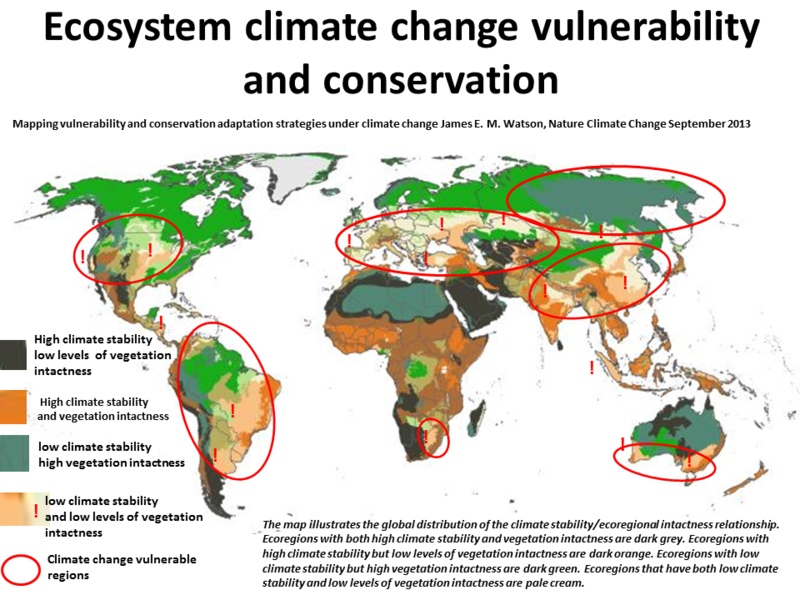 The map is from Mapping vulnerability and conservation adaptation strategies under climate change James E. M. Watson, Sept 2013 Nature Climate Change ' The relationship between intactness (adaptive capacity) and stability (exposure) varies widely across ecoregions, with some of the most vulnerable, according to this measure, located in southern and southeastern Asia, western and central Europe, eastern South America and southern Australia. 2009 Amazon could shrink by 85% due to climate change, scientists say​. ​Boreal: Northern forests face onslaught from heat and drought-a well as other world forests. 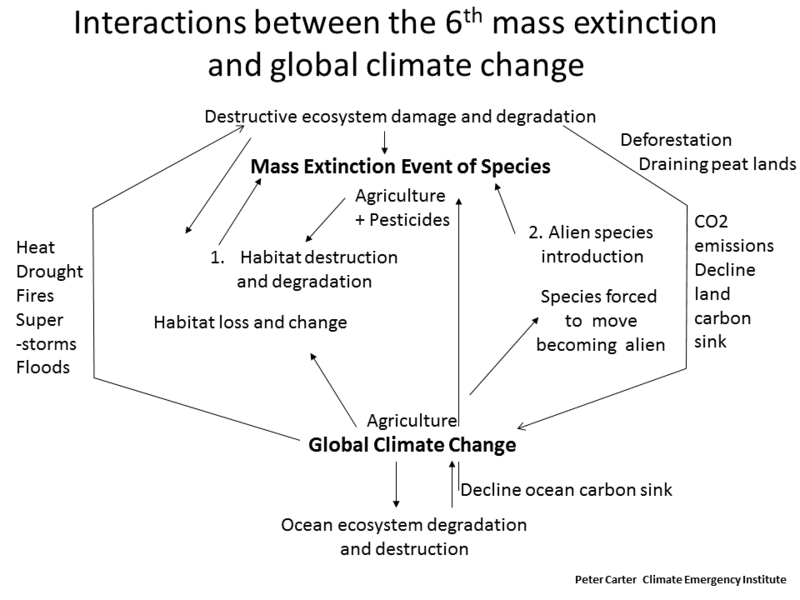 ​Jan 2015 T. Webb Global Patterns of Extinction Risk in Marine and Non-marine Systems 20-25% well known species threat extinction same as land plants & animals. Nov 2014 Potential Disruption of Pollination..
​​April 2014 Wildlife response to climate change underestimated (bird research). Feb 2014 Many species of fish living near the Equator will not thrive . Feb 2014 Amazon projected ​to become net carbon source. Nature Drought sensitivity of Amazonian carbon balance ..
​Feb 2014 Amazonian drought conditions add carbon dioxide to the atmosphere. Jan 2014 Tropical ecosystem climate sensitivity increasing as capacity to store carbon declines, due tp drying and drought. ​​Nov 2013 High-Res. Global Maps of 21st-Century Forest Cover Change Earth satellites map global forest loss (2.3 million sq. km) and gain (0.8 million sq. km.) from 2000 to 2012. The 2005 Exeter Dangerous Climate Change conference confirmed the long held opinion that 1 to 1.5C at a warming rate limit of 0.5C per century ​is the danger limit for species and ecosystems. ​The conference published a comprehensive table of the ecology and rising degrees of warming. As in general global climate change will​ harm wildlife directly and exacerbate ongoing harm that has lead to the 6th planetary mass extinction even. S​pecies being wiped out at 1000 X natural rate Pimm May 2014 mainly caused by habitat destruction and invasive species. Global climate change will lead to habitat damage and destruction, making species seeking new habitats 'alien'. ​​The 2016 WWF Living Planet Index finds global populations of fish, birds, mammals, amphibians and reptiles declined by 58 per cent between 1970 and 2012. A large fraction of both terrestrial and freshwater species faces increased extinction risk under projected climate change during and beyond the 21st century, especially as climate change interacts with other stressors. 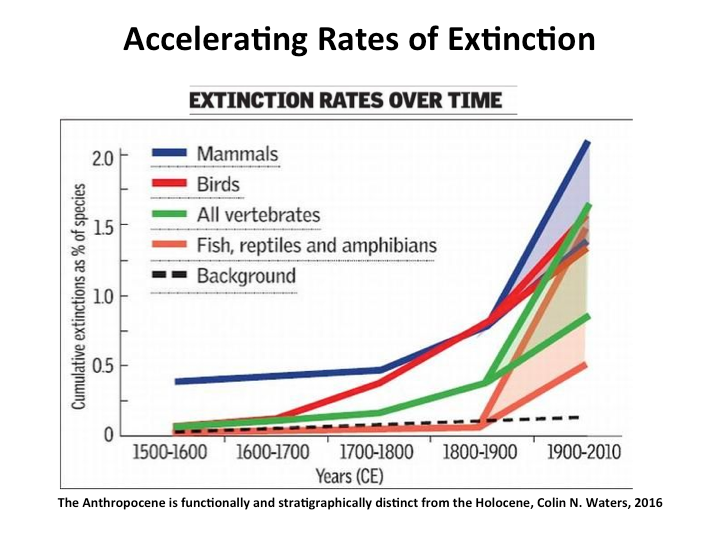 [CURRENT RATE OF EXTINCTION IS 100 x NATURAL BACKGROUND RATE: S. Pimm, Science, May 2014.] Extinction risk is increased under all RCP scenarios, with risk increasing with both magnitude and rate of climate change. (AR5 WG2 SPM p. 14). A large fraction of the species assessed is vulnerable to extinction due to climate change, often in interaction with other threats. Species with an intrinsically low dispersal rate, especially when occupying flat landscapes where the projected climate velocity is high, and species in isolated habitats such as mountaintops, islands, or small protected areas are especially at risk. Cascading effects through organism interactions, especially those vulnerable to phenological changes, amplify risk (high confidence (AR5 WG2 Table TS4). ​​The AR5 ​​uses only the crude speed a species can move to escape increasing degrees of global warming (not the full climate disruption). Obviously, as also recorded in AR5, there many other adverse climate change effects. ​​Even so the shocking AR5 finding is that trees and plants in general lose favorable climate space (AR5) by 2.0C global warming. They cannot escape or adapt to the rate of warming affecting their health and supporting ecosystems from a 2.0C global warming (N.B. local land warming is higher than global warming). AR5- Losing favorable climate space is projected to lead to reduced fitness, declining abundance, and local extinction, with potentially large effects on biodiversity and ecosystem services (see evidence of early signs of this widespread tree mortality). On top of losing climate space, climate change causes increasing drying & drought, insect infestation, forest fires and supportive species mismatches, making the situation very much worse. Most trees and plants cannot be expected to survive 2C. Only the best case emissions scenario RCP2.6 give tree and plant species a chance of surviving climate change. 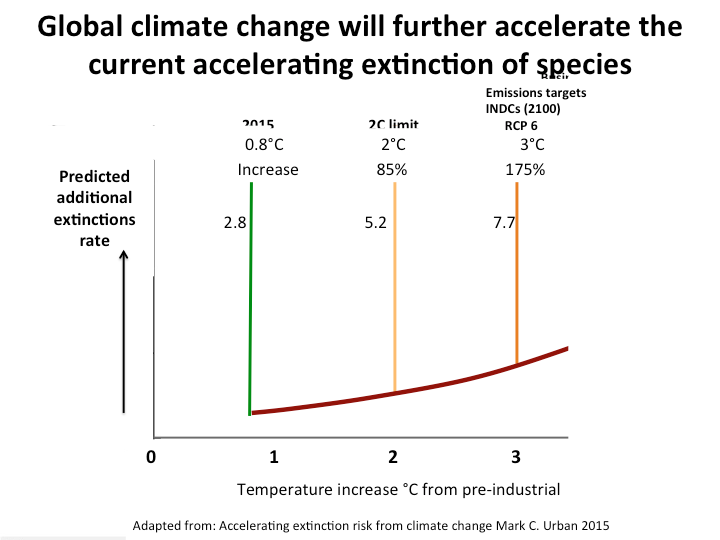 All other scenarios are above 2.0C by 2100. The impact on tree survival (among other species)will be even more under-estimated due to establishment in a new location. AR5- ​​Estimates of tree displacement rates are frequently based on models or observations of dispersal of seeds controlling establishment of adult trees. Displacement rates of trees are often more strongly limited by establishment than dispersal. Limits on establishment could also be important for other species groups, but often only dispersal rates have been calculated, leading to an overestimation of displacement rates. (AR5 WG2 -298). Community interactions not in the models ​​includes what is today the largest cause of species extinctions, which is deforestation and ecosystem alien species. The further large loss of forests will drive populations and species extinctions faster than estimated by climate space models, and even species that can move fast will be alien species. AR5 reports ​​​​​Extensive tree mortality and widespread forest die-back (high mortality rates at a regional scale) linked to drought and temperature stress have been documented recently on all vegetated continents​​. ​long-term increasing tree mortality rates associated with temperature increases and drought have been documented in boreal and temperate forests in western North America. Episodes of widespread die-back (high mortality rates at a regional scale) have been observed in multiple vegetation types, particularly in western North America, Australia, and southern Europe. 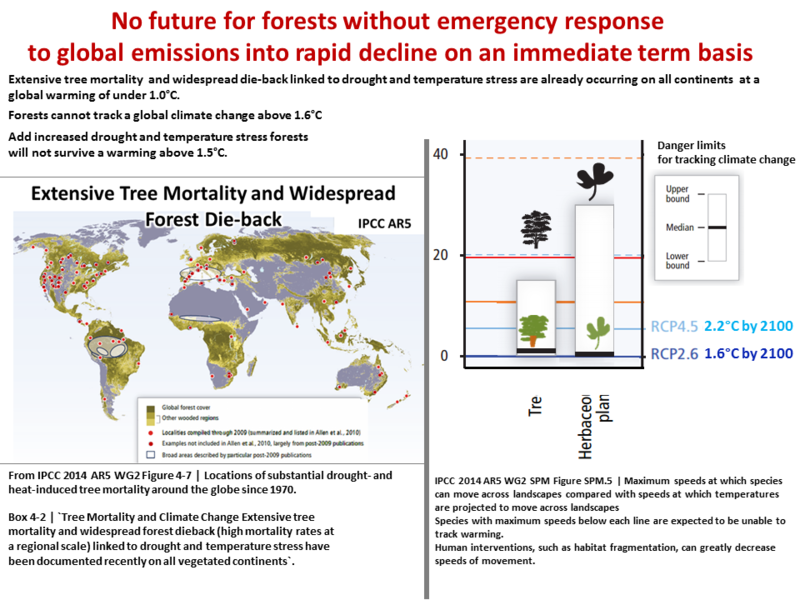 (AR5 WG2 Box 4-2 Tree Mortality and Climate Change). ​In addition forest fires are increasing and will be widespread by 1.8C global warming. 39 million acres - global deforestation is on an upward trend,2nd worst year ever. May 2018 State of World's Birds​​. One in eight bird species threatened with extinction. March 2018 ​​Biodiversity and Nature’s Contributions Continue Dangerous Decline, Scientists Warn. ​​21 Mar 2018 Europe Where Have all the Farmland Birds Gone? Inquirer Catastrophe Pesticides eradicating insect food of birds. ​3.2C could lead to the loss of almost 50% of animal species in the Amazon. Around 60% of all species Madagascar – and up to 80% of mammals out in the Miombo Woodlands in southern Africa. 13 Sept 2017 Science Daily (See maps)​​Climate change challenges the survival of fish across the world first analysis looking at how vulnerable the world's freshwater and marine fishes are to climate change. ​Recovery after “Great Dying” Was Slowed by More Extinctions- all casued by volcanism CO2. 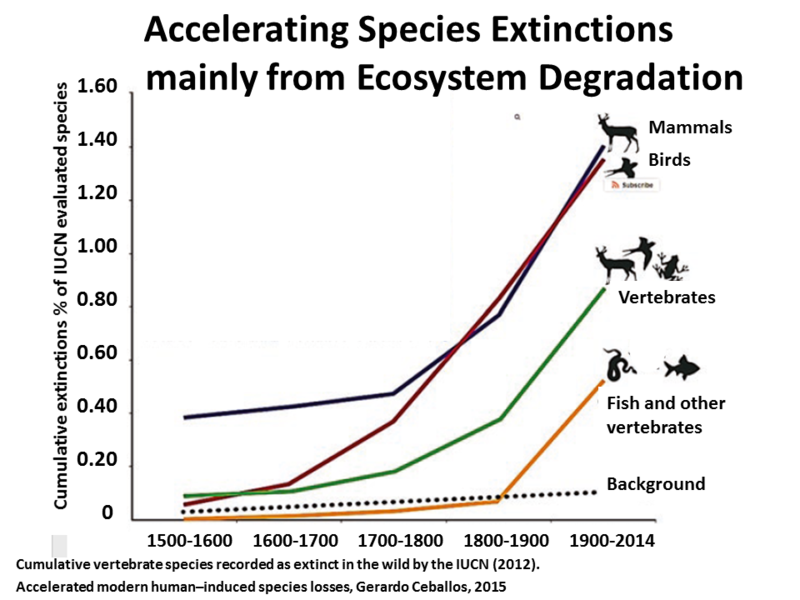 The simulation indicates that the initial spark for extinction cascades as a result of climate change mostly originates from plant species-transferred to animal species. 2015 The Anthropocene is distinct from the Holocene​​, Colin Waters. ​​10 Nov 2016Climate change already dramatically disrupting all elements of nature. ​What Would Happen If All Earth’s Insects Vanished? Science Explorer 2015 ​If insects were to disappear, the world would fall apart — there's no two ways about it,"
It is time to combine the accelerating decline of biodiversity loss with accelerating global climate disruption, as each accelerates the other. 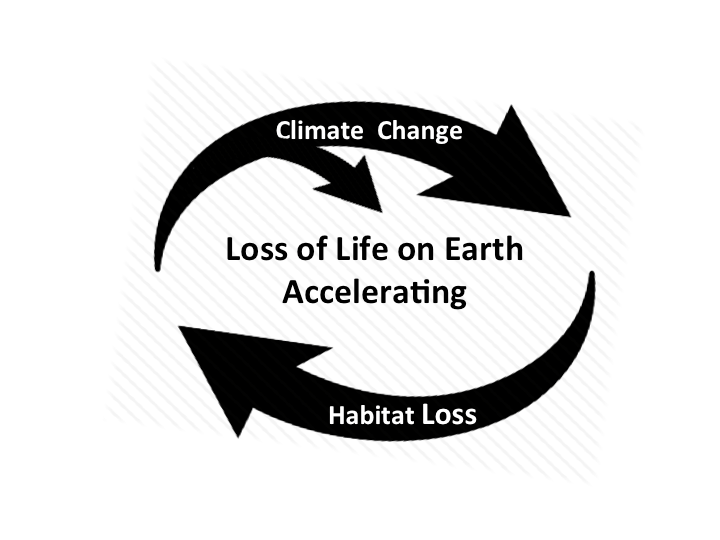 Habitat loss ​(mainly deforestation) has brought on the 6th mass extinction, and deforestation is a major source of CO2 emissions, which will cause climate change driven even faster increased habitat loss and extinctions. Nov 2016Climate change already dramatically disrupting all elements of nature.